Following the Legislative Council's decision on Wednesday to reject a motion to hold a public consultation to explore anti-discrimination laws on the basis of sexual orientation, members of Hong Kong's LGBT community have called on the community to come out in full force at the pride march on Saturday. Many members of Hong Kong’s LGBT community have expressed their disappointment with the result of the vote taken at Thursday’s Legislative Council (LegCo) meeting. Hong Kong lawmakers rejected LegCo member Cyd Ho Sau-lan’s motion to have the government conduct public consultation on enacting legislation to safeguard equal opportunities and the basic rights of people of different sexual orientations. Although a majority of geographical constituency (GC) members voted in favour (21 for and 8 against with 4 abstentions), the motion was defeated as it failed to gain the support of the functional constituency (FC) legislators (10 for and 17 against with 8 abstentions). Under Hong Kong's legislative system, 35 GC legislators and five FC members are elected by the people while the rest of the 30 FC legislators are returned by members who belong to certain business, professional and other interest groups. For a motion to pass, both constituencies need to have over 50% of support. Traditionally, the President does not vote although it is not a constitutional requirement. with pop star Anthony Wong, Mrs Leung (Billy Leung's mother) and Billy. Members of the LGBT community have expressed their disappointment with the decision which they note is only a preliminary step to determine if there’s a need to implement additional laws. Kit Hung, an openly gay filmmaker (who directed Soundless Wind Chime), told Fridae that not only is he disappointed with the result but he feels that the final decision had in fact overrode the views of the public given that the majority of GC members had supported the motion to hold a public consultation. 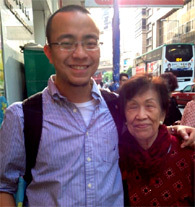 Billy Leung and his 84-year-old grandmother will be at the Pride Parade on Sat. Billy Leung, an activist who in 2004 at the age of 20 successfully challenged Hong Kong's age of consent law for gay men, said he was was disappointed at the defeat of the non-binding motion. "You cannot teach your kids to love your neighbours on one hand and turn around and say 'but not them (LGBTs)'. It is illogical. It is discrimination. And discrimination is never a family value," he said. “We have seen how much noise those who advocate for hatred have made. We cannot be stronger without each one of us being counted. Discrimination and ignorance will not magically disappear when all we want is to be invisible to others,” he added. Leung will attend tomorrow’s parade with his 84-year-old grandmother for the first time while his mother spoke at a press conference on Wednesday in support of the motion. Hong Kong’s only openly gay legislator Raymond Chan Chi-chuen, who was last month named “rainbow ambassador”, is expected to lead several thousand participants through Causeway Bay. Gay pop singer Anthony Wong, and LGBT rights ally and singer Denise Ho will perform at the post-parade concert. The parade will start at the Water Fountain Plaza, Victoria Park, Causeway Bay at 3pm on Sat, Nov 10. Fridae is proud to be the official media partner of the Hong Kong Pride Parade 2012. Just finished the parade walk.It was great. Psychic jacks tonight! How many attended the Parade? when is that gonna happen in mainland of China ?